Why the settlement? Wish.com sells a wide variety of items on its website. Wish often advertises discounts or sale items, along with an "original" or "regular" price and a corresponding percent discount from that "original" price to the sale price. The Plaintiffs who filed this case allege that the "original" prices are often inflated higher than the real "original" price. 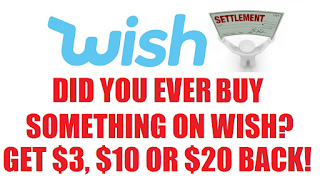 As a result, the Plaintiffs allege that Wish.com advertises discounts that are greater than in reality in order to induce people to buy these "sale" items. The claim period ends on 8/1/18, that means you will not hear back from them for AT LEAST A YEAR. Please be patient, these things take a long time to make their way through the courts, but once it is settled you will get your money.